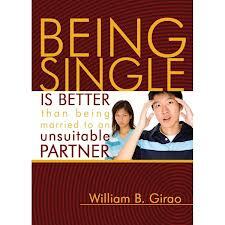 Married and Single Life Research Papers delve into the advantages and disadvantages of both lifestyles. Sociology research papers that study married versus single life can explicate the two dynamics from the perspectives of marriage, family and relationship theory. Have Paper Masters custom write your research paper on either married life, single life or compare and contrast the two. Few people are encouraged by society to remain single. Instead, parents, relatives, and friends often persuade their loved one to find a spouse and “settle down.” A comparison of life as a married person and as a single person demonstrates that both lifestyles have advantages and disadvantages when one examines the cost, freedom, and companionship available to each. Many believe that two people can live more cheaply than one. But typically this is only true if both spouses are working and willing to share space and property. Generally, a married couple will need and want more space than that which a typical one-bedroom apartment offers. One car is also difficult to share between two individuals. A single person, on the other hand, will be satisfied with less space, furnished with odds and ends. Married couples enter the world of status symbols, requiring matching furniture and suitable decorations – all of which are more costly. Undoubtedly, the single person has more freedom than the married couple. When two people are connected by marriage, it is customary that they spend time together. Additionally, they usually want to know where the other individual is going to be. Accompaniment on trips to visit the in-laws or to the boss’s house is also expected, whether a spouse wants to go or not. When it comes to the issue of companionship, however, marriage wins. Two people who love one another have ample opportunities to spend time together and to learn all there is to know about each other. So, less space and sharing a car result in cherished times spent together. Required trips to visit families are made more enjoyable because it becomes a moment during which two people are sharing an experience. Though single people have plenty of space and freedom, they sometimes long for the companionship that their married friends enjoy. In summary, there are benefits and hindrances to life as a married couple and life as a single person. At first glance, it may appear that the unmarried person has all of the advantages – money, space, freedom. But all of these advantages come at one exorbitant price. There is no one with whom to share them. Perhaps, parents, relatives, and friends offer sound advice after all. American Society - Many sociology courses will study American society in research papers and course projects. History Marriage America - History Marriage America research papers examine the evolution of the importance of marriage over the eras in America. Celibacy and the Catholic - Celibacy and the Catholic Church research papers overview the history of celibacy and the priesthood in catholicism. Durkheim and Suicide - Durkheim and Suicide research papers discuss Emile Durkheim's theory of suicide. Arranged Marriages - Arranged Marriages Research Papers evaluate the cultural traditions of the middle eastern countries. Marriage A-la-Mode - Marriage A-la-Mode Research Paper looks at a book that was a comedy depicting the battle of the sexes. Interracial Marriage - Interracial Marriage Research Papers examine the major strides American society has made in eliminating racial bias over the last 3 decades. Gay Marriage - Gay Marriage Research Papers discuss moral and ethical standings on the topic. Order a research paper on gay marriage from Paper Masters. Opposing Gay Marriage - Opposing Gay Marriage Research Papers look at the arguments that oppose gay marriage, such as religion. Gay Marriage in the Military - As of September 30th, 2011, gay marriage in the U.S. military is legal. Christian Point of View of Marriage - Christian's Point of View on Marriage Research Papers discuss their view on marriage and divorce. Hope-Focused Marriage Counseling - Hope-Focused Marriage Counseling Research Papers on the book Hope- Focused Marriage Counseling by Everett L. Worthington. In Favor of Gay Marriage - In Favor of Gay Marriage Research Papers delve into the cohabitation argument. Face Saving in Marriage - Face Saving in Marriage Research Papers look at a sample of a research paper order placed for an analysis of a topic. John Gottman - John Gottman is one of the leading experts on what factors sustain and promote a good marriage. History of Marriage - History of Marriage research papers look into the definition of marriage, which is always changing. History of Gay Marriage - History of Gay Marriage research papers discuss the debate of allowing gay marriage that began in 1970. American Family - The American Family is examined in sociology research papers from Paper Masters. Protecting Personal Property - Protecting Personal Property Research Papers delve into the different factors that effect dividing property in a divorce. Family Diversity - Family Diversity Research Papers discuss the different family structures from 1900-2000. Paper Masters writes custom research papers on Married and Single Life and delve into the advantages and disadvantages of both lifestyles.